Can you smell it? The scent of turkey drifts through the air, accompanied by a pile of mashed potatoes dripping in gravy, with a slice of pumpkin pie for dessert. This week brings with it the official celebration of Thanksgiving, and if you’re in marketing, you know what that means: the perfect opportunity to engage with your target audience. Holidays like Thanksgiving are a great chance to connect with customers on something they’re already talking about. If you’re not sure where to begin your marketing efforts this week, here are seven big ideas for you to take advantage of with Thanksgiving marketing. 1. Send a holiday message. One simple way of engaging with customers over the holidays is sending them a heartfelt message. Send a personalized Thanksgiving email out to customers, wishing them a happy holiday. Or, consider sending a handwritten note, expressing your gratitude. People love receiving holiday mail, so get on board by sending out Thanksgiving messages. 2. Engage in social media. The holiday season—including Thanksgiving—is the perfect time to engage on social media with a company account. Use this week as a chance to wish followers a happy Thanksgiving, share about things the business is thankful for or generate user content by asking followers to send in their favorite Thanksgiving recipes. 3. Use a festive infographic. Emphasize the sense of sharing this holiday season by using a festive infographic in your marketing efforts. Include fun Thanksgiving facts, recipes or tips for how to survive the holidays. Infographics generate engaging—and shareable—content in a tangible way to reach out to the audience connect them with your platform. 4. Host a Thanksgiving contest. Everyone loves a good contest, and Thanksgiving is the perfect time to host one. Host a contest via your social media pages (“like and comment on this post”), through retail shopping (“the first 20 buyers”) or even with a competition (“the best-tasting pie”) and give out prizes for the winners. Of course, keep the prizes in-line with the Thanksgiving theme. Thanksgiving is a family-oriented holiday, so use this as an opportunity to discuss about the family within the company. Share about staff members through business platforms in order to engage with customers and personalize the brand. For instance, host a different staff member each day this week on a video series about their favorite Thanksgiving traditions. It’s the season of gratitude, so why not thank your customers? Be intentional about reaching out to customers and thanking them for their support of the business. Whether you reach out via email, personal note or even on a social media post, your gratitude will go a long way in engaging the target audience. 7. Prep for Black Friday. Finally, don’t forget about Black Friday! According to the National Retail Federation, 174 million Americans shopped on Black Friday weekend in 2017, and the average spending per person was $335.47. Share in numbers like these by hosting Black Friday sales, advertising them consistently and of course, preparing your marketing strategy. 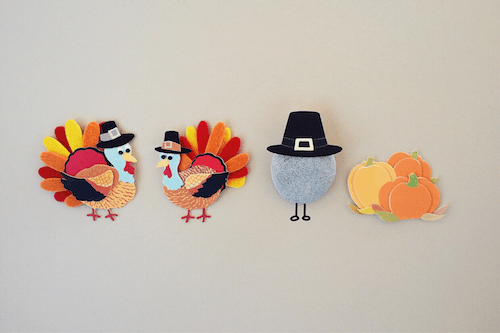 Thanksgiving is officially here, which means your marketing strategy needs to be ready to go. Use these seven big ideas to your advantage when marketing this Thanksgiving, and help prep the business for the upcoming holidays. © 2019 Hahn Printing Inc.